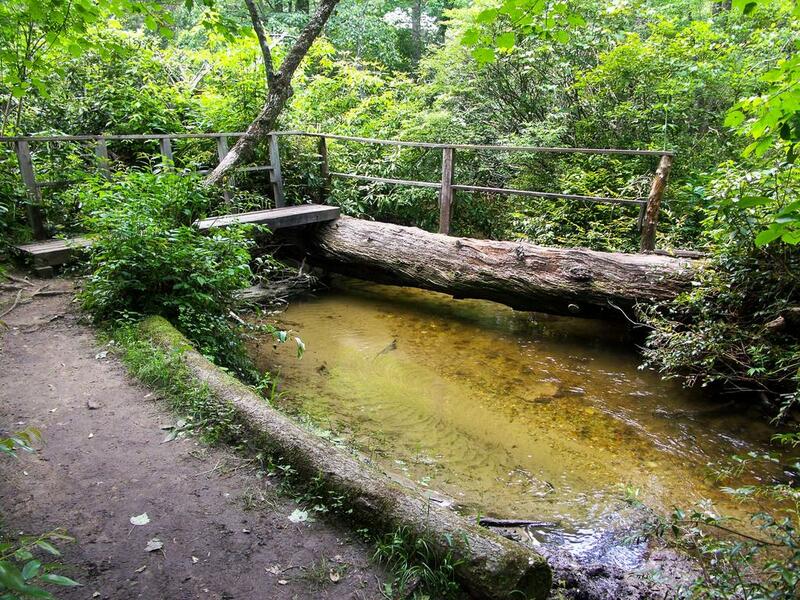 This relatively flat loop hike - which features a shortcut option - is all about water. 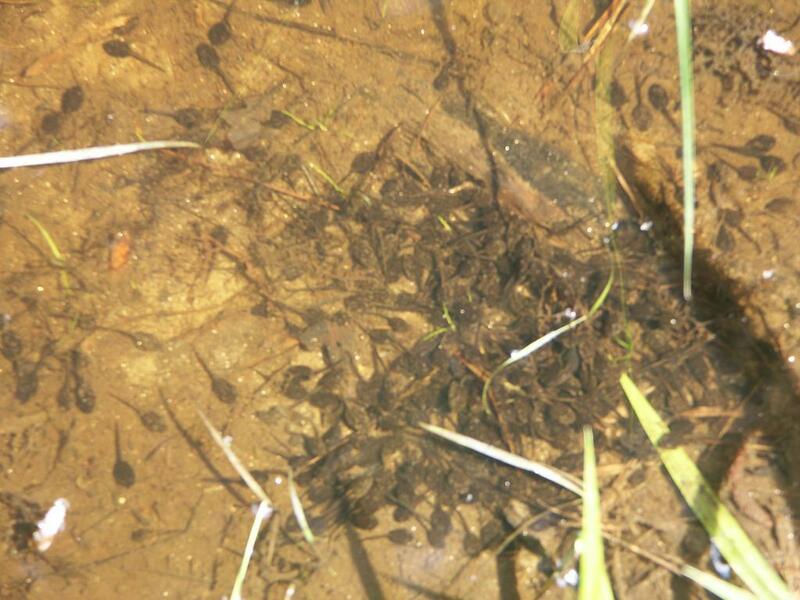 You'll see rare mountain bogs, including glimpses of some rare and endangered species of plants if you're lucky. 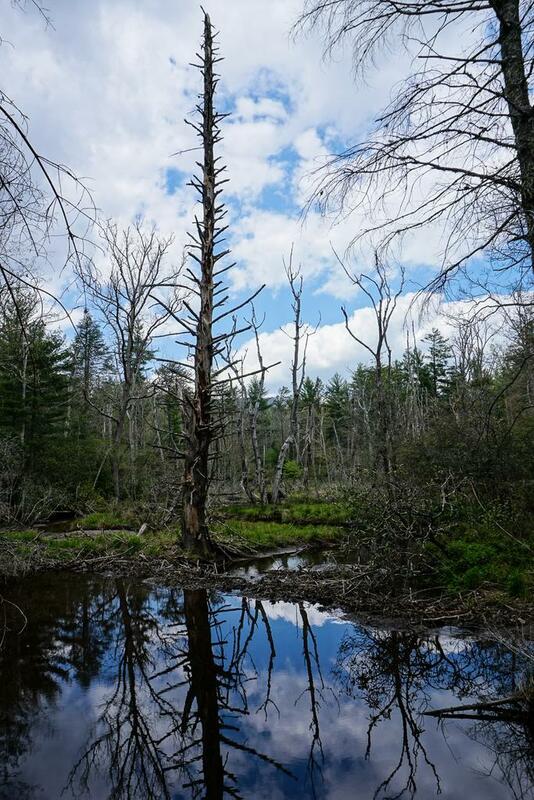 You'll pass through a forest in transition, as beavers have dammed the South Fork Mills River to form their ponds, which are drowning out the trees. 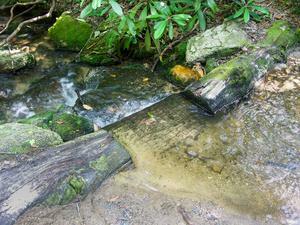 You'll also find crystal clear brooks, wildlife meadows, scenic fern-filled woods, and an optional waterfall. This forest is one of the first to ever be managed through modern forestry techniques, earning it the nickname "The Cradle of Forestry in America." From Asheville, take I-240 west to I-26 east to exit 40, Asheville Airport/NC 280. Turn right onto NC 280; follow this 4-lane highway for 16 miles toward Brevard. At the intersection with US highways 276 and 64, turn right onto US 276 west (follow signs for Pisgah National Forest). 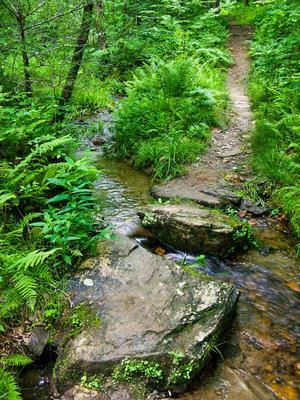 Proceed on 276 for 11.4 scenic miles through Pisgah National Forest to the Pink Beds Picnic Area, just past the Forest Discovery Center on the right. The trail starts at the sign board at the back left side of the parking lot. 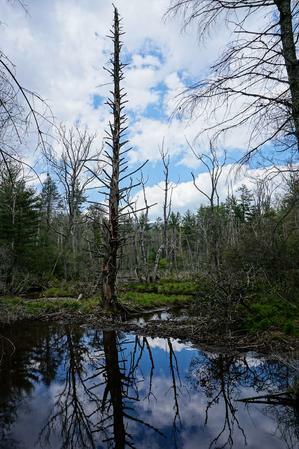 This tree was flooded out by beaver dams. 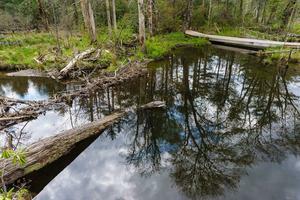 Many trees have been cleared by beavers in the area around the South Mills River, creating openings in the forest. 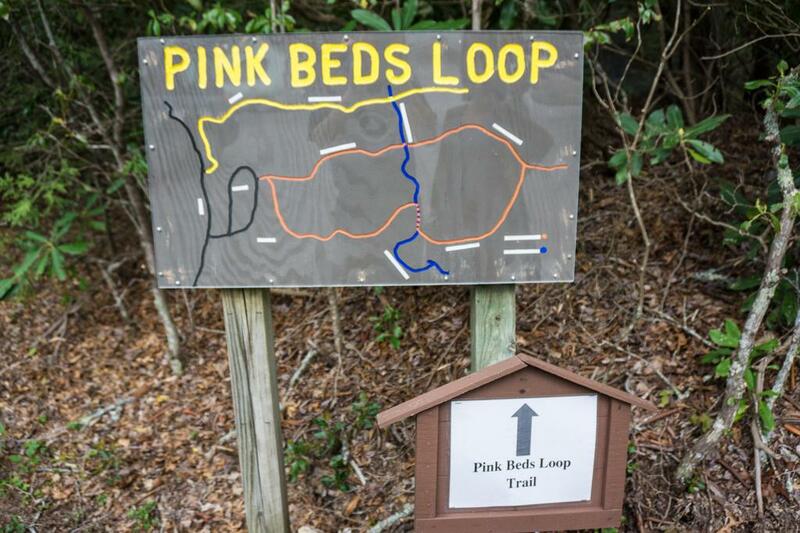 Originally named for the profusion of pink wildflowers that grew here in the spring (including mountain laurel and rhododendron), Pink Beds is not really all that pink. With the notable exception of Swamp Pink (or Helonias), a rare pink flower which loves the mountain bogs found in this valley, most of the wildflowers here are common to the region and something other than pink. 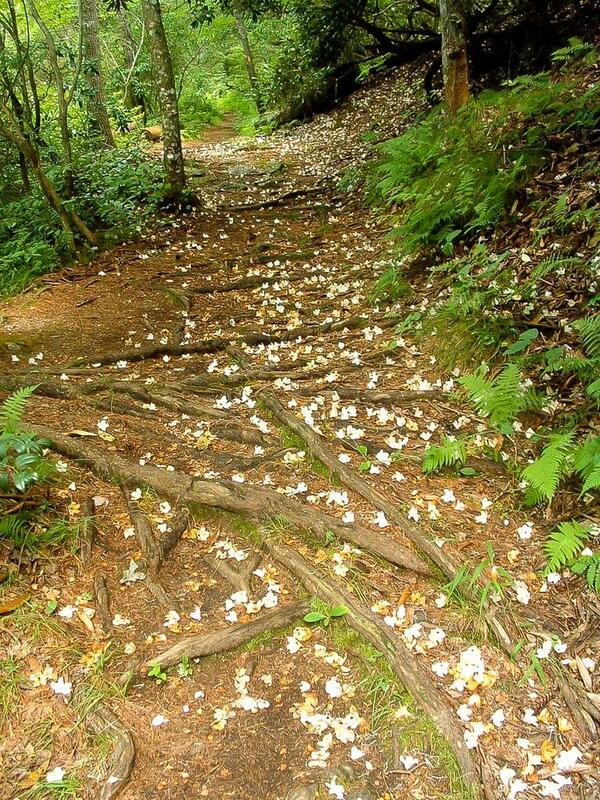 Mountain Laurel and Rhododendron are somewhat plentiful and host shades of pink in their blooms, but the Forest Service describes the name as being mostly historical. At any rate, the relatively flat valley sits at a high elevation (about 3200'), and contains beaver dams, clear babbling brooks, very large pine trees, and scenic open woods, meaning that even outside of bloom season there's plenty to enjoy. Having just tumbled off the ridges above, the South Fork of the Mills doesn't look like much of a river yet. 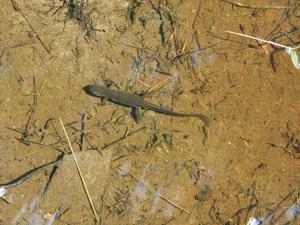 But it eventually grows to become one of the larger tributaries in the French Broad River system. Since its headwaters are protected on all sides from pollution by large mountains and intact forests, resulting in outstanding water quality, the river and some of its tributaries are up for National Wild and Scenic River status. It would require an act of Congress, but it would be the longest river in the state to be so designated if it happens, and would provide additional protections to the river's watershed to maintain that quality. That would a good thing, because the city of Asheville draws from this river for its drinking water downstream. 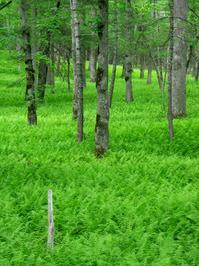 This valley is also notable in that it is part of the area called the "Cradle of Forestry" in America. It's where modern forestry techniques, research, and education were first developed by George Vanderbilt's Forest Managers back in the late 1800's. You can learn more about that at the Forest Discovery Center and Museum, the entrance to which is a few hundred yards south of the Pink Beds Picnic Area on US Hwy. 276. Begin the hike on the gated road leading away from the left side of the parking area beside the map. 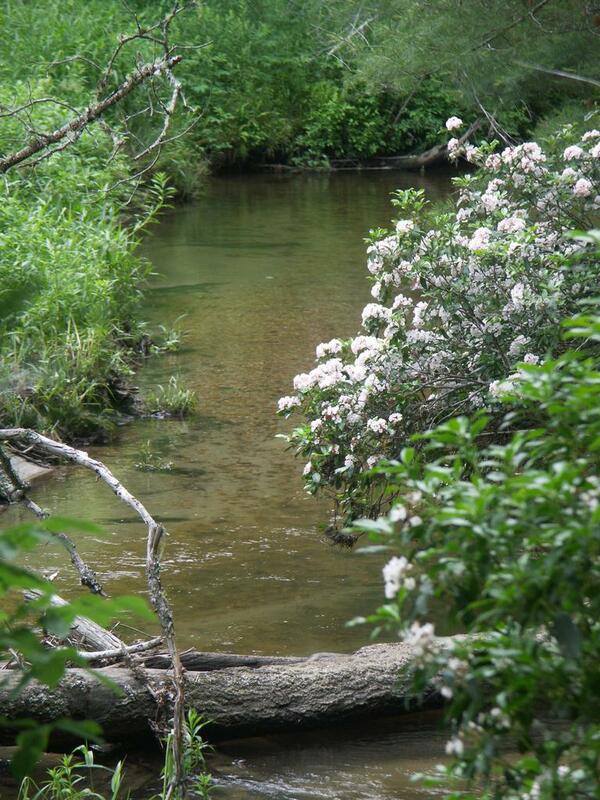 It soon reaches a crossing of Pigeon Branch, the headwaters of South Fork Mills River. There is a footbridge off to the right side of the road, and then you reach a split. The loop can be hiked either direction, but I'll describe it going counter-clockwise, so turn right if you want to follow along. The trail loosely parallels the South Mills River and its tributaries downstream from here all the way to the tip of the loop. 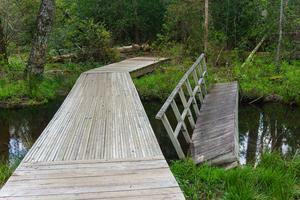 This trail occasionally crosses the river and its tributaries on bridges, boardwalks, or footlogs all the way around the loop. One makes innovative use of a huge fallen tree. Footing is generally good, though there are lots of roots in places. Coursing through an undergrowth of twisted Mountain Laurel, the trail passes some very large pine trees at the beginning of the hike and their soft needles carpet the path. You'll reach the next series of bridges in short order, just upstream of where Pigeon Branch and another tributary meet to officially start the South Fork. The trail gradually curves to a more northeasterly direction past these crossings. 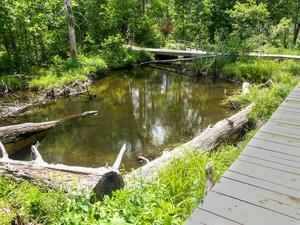 This old broken bridge lies beside the new, sturdy boardwalk structure along the Pink Beds loop trail. You'll reach the first boggy area, and it is crossed by a sturdy boardwalk structure (built in Februrary 2013). 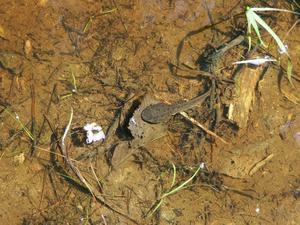 The wetlands are more reminiscent of something you'd see on the coastal plain than here in the mountains. Some of these are natural mountain bogs, one of the rarest and most sensitive habitats in the southern Appalachians. These upland bog areas contain several rare and endangered plant species such as Swamp Pink (Helonias bullata) and are full of wildlife. 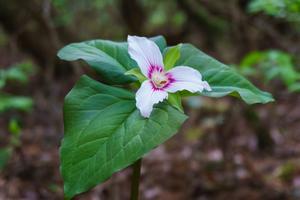 Enjoy their unique beauty from the trail or boardwalk. 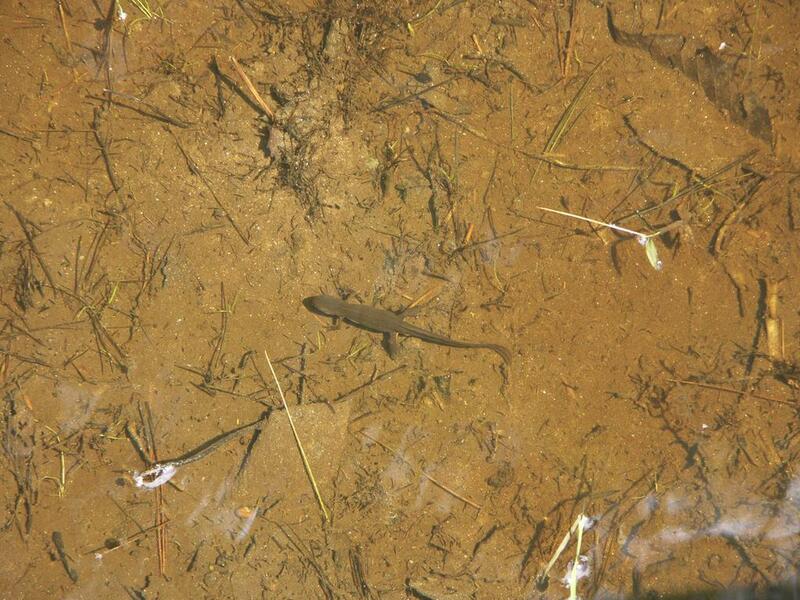 During the warmer months, you can look down into still waters teeming with life 3 feet below you. 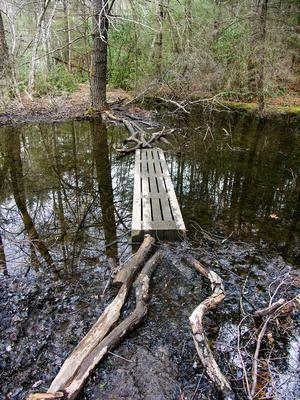 Some of these boggy areas have been enlarged or even created anew by busy beavers, and you may see their dams (as well as the remains of old footbridges that used to serve the trail adequately before beaver activity and floods altered the stream channels). Large trees which once stood on dry ground beside the river have died or fallen over as they've been flooded out. For a couple of years, a particularly rich habitat for aquatic species was under the flooded, upturned roots of a big fallen maple tree on the right, beside the boardwalk. But the beaver activity comes and goes, and as of 2018 the old dams have started to decay, indicating that they've moved on for a time. In all likelihood, they'll be back again someday. 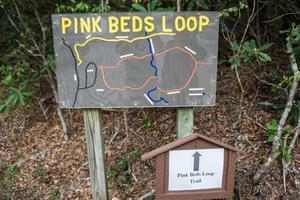 The Pink Beds Loop trail crosses a small tributary in this area filled with doghobble. 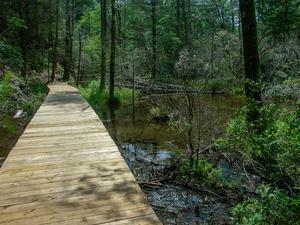 Beyond the boardwalks, the stream largely returns to its channel and the trail follows it on a dry path. 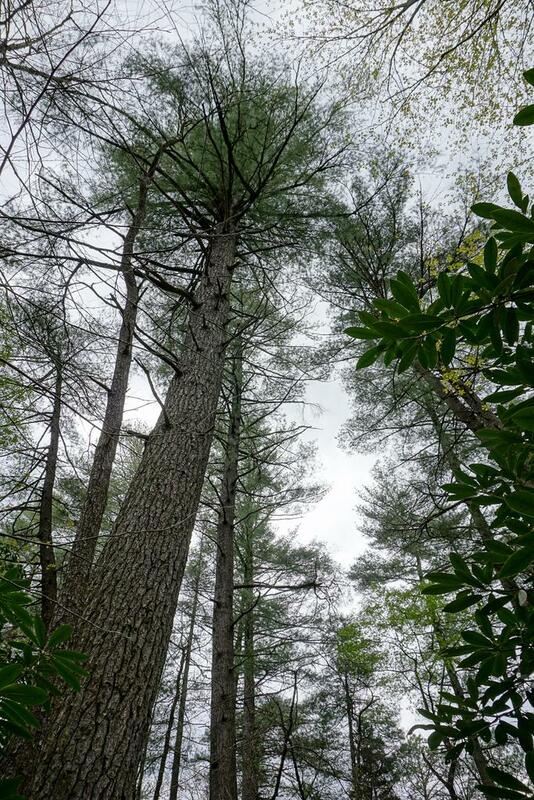 The forest returns to something more typical of what you usually find across the southern Appalachians, with tall mixed hardwoods trees growing along with some pines and hemlocks, with an understory choked with doghobble, mountain laurel, and rhododendron. You will come to the intersection with the Barnett Branch trail. 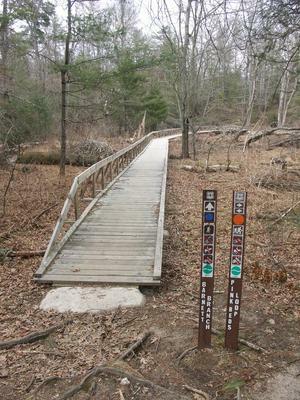 To the left, the trail cuts through the middle of the loop, across an older bridge & boardwalk, and ends up on the other side of the loop, making a half-loop hike possible. This is recommended if you're short on time or have children in tow who can't hike the entire loop. The Pink Beds Loop and Barnett Branch trails continue together straight; almost immediately, the Barnett Branch trail splits off to the right to ascends Soapstone Ridge and to reach the Black Mountain trail on Rich Mountain. The Pink Beds Loop continues to the left at the split; go that way. Formerly, past this intersection, the Pink Beds Loop trail went back down into an open area where beaver dams have made quite an impact on the forest. 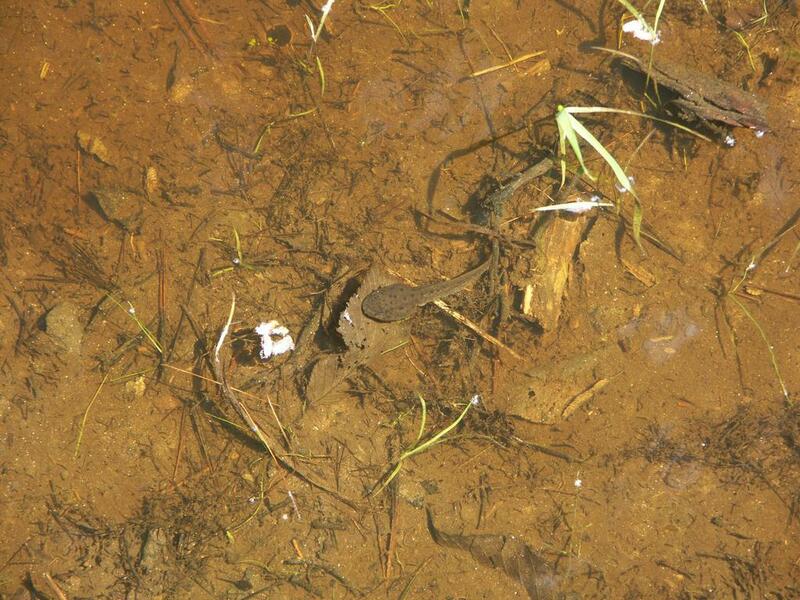 The meandering stream is lined by tall grasses and a few dead trees with bogs in between. However, the trail was re-routed onto higher ground in 2009, and now climbs gently through drier woods. 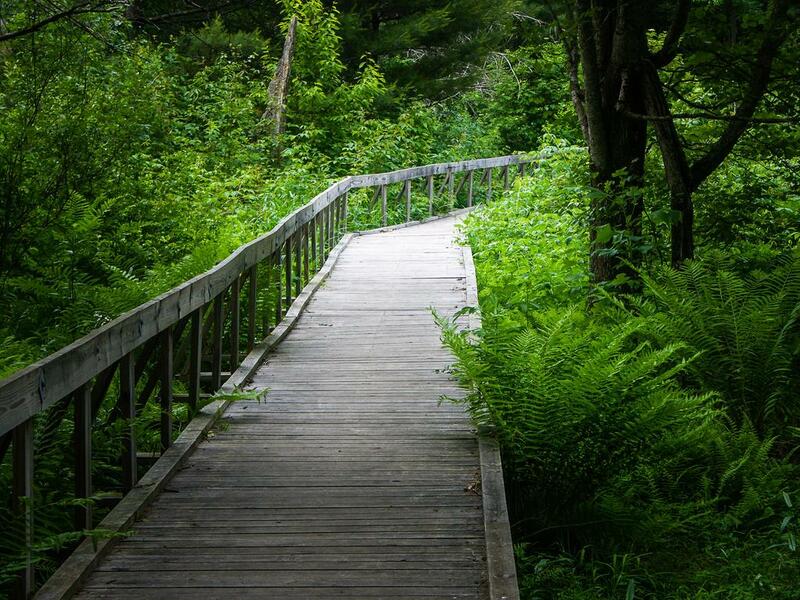 It winds in and out of small coves, crossing one tributary in a stand of dead hemlock trees and another on a sturdy bridge, and passes some huge white pines. Limited views back across the valley - mostly in the wintertime - are possible in at least one spot, owing to the trail being situated on higher terrain. 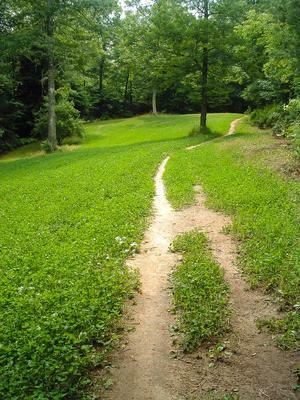 It's not long before the trail descends again, curving into the cove of an unnamed tributary draining Soapstone Ridge. It crosses the tributary and then re-joins the river in an open woods area, before crossing the river yet again for the last time on a new, sturdy bridge. 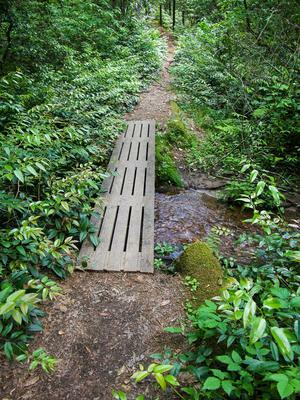 Past this bridge, the trail resumes following the river downstream and enters some remarkable fern-filled woods. You'll come to the next intersection in short order, and this is the point on the loop farthest from the parking area. The trail to the right leads to the gauging station and parking area on FS 476 - the old South Mills River Road. So turn left here to begin the return to the parking area, and start a gradual ascent into the "foothills" (so to speak) of the Pisgah Ridge. 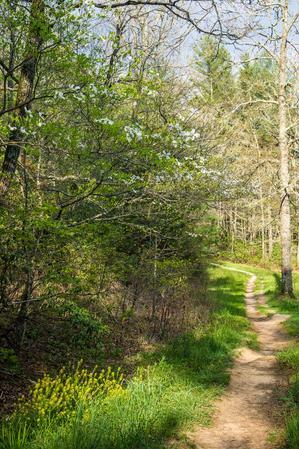 The trail never gains an appreciable amount of altitude, but it does climb bit as it rises above the valley bottom, and it takes you through beautiful open forests of oak and tuliptree. 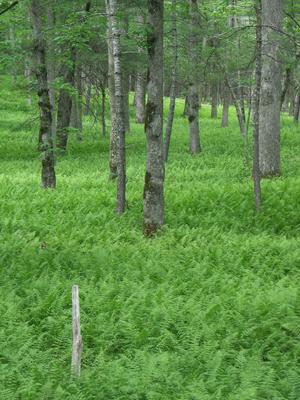 Some areas are completely carpeted by ferns; others look like more typical woods, although they are rather open as a result of some controlled burns in recent years. These fires cleared out much of the undergrowth including the mountain laurel; lush sprouts of laurel now ring the old dead bushes and will soon again put on a remarkable flowering display when they get a little older. 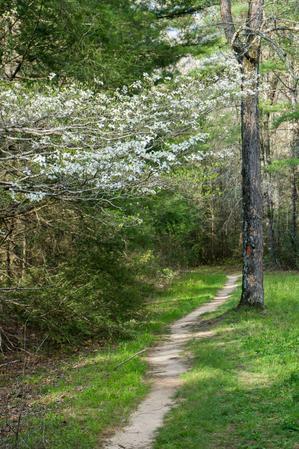 The trail gradually turns into more of a old woods road as it loops around and heads back toward the parking area. It is eroded in spots, but has been re-routed around the worst of them. You will cross several crystal-clear tributaries trickling down from the Pisgah Ridge toward their junctions with the South Fork Mills River. 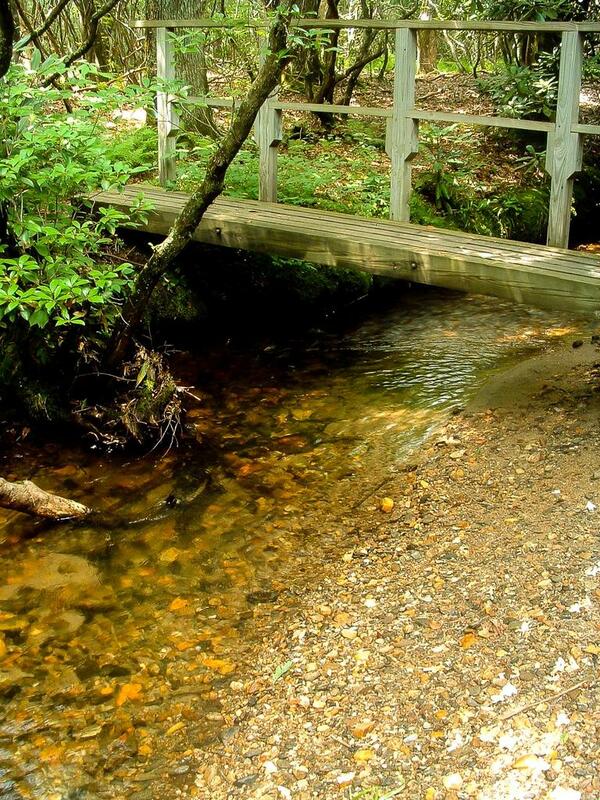 Some crossings have bridges, but some of the smaller ones do not. Still, you can rock-hop them all and stay dry. Unique erosion control structures on the Pink Beds Loop trail. 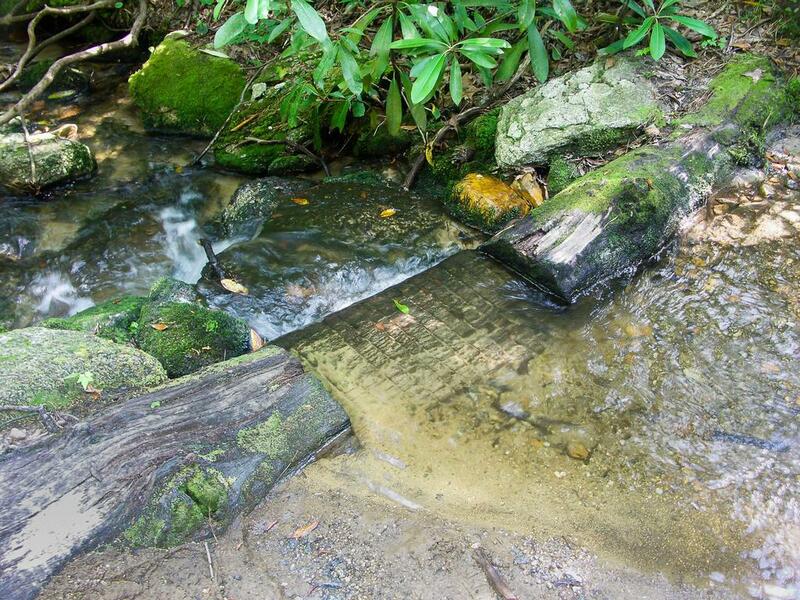 On these smaller streams, look for the logs embedded in the downstream side of the old road with a notch cut in them to let the water flow out. This old erosion-prevention technique, which I have not seen used in modern Forest Service road building and I assume came from the earlier days of forestry in the area, still works beautifully after all these years. 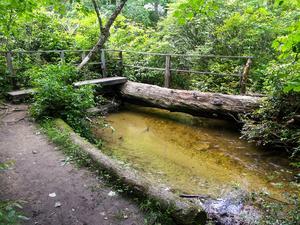 The logs do not rot because they are constantly wet; the notch seems to be sized just correctly to hold the trail back but let the water flow out. It's really simple and I find it brilliant. Something to remember if you ever find yourself building a road and needing to ford a stream! This waterfall beside the Barnett Branch trail makes a good side destination from the Pink Beds Loop Trail. 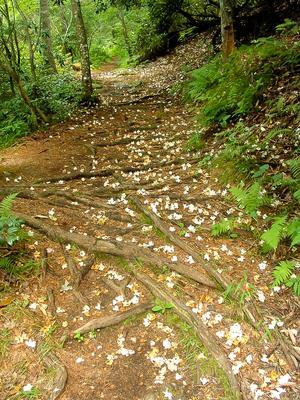 There are many tunnels of rhododendron and laurel along this stretch of the trail, and if it starts to rain you will stay dry for a while. 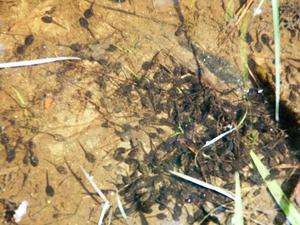 Then again, if it stops raining, they will drip on you for a long time after it quits! You'll reach the other intersection with the Barnett Branch trail on this stretch of the hike as well. If you're ready to get back to your car, just continue straight to complete the loop. However, if you've got the time & energy, a waterfall is located about a mile northwest on the Barnett Branch trail; turn right to see it. 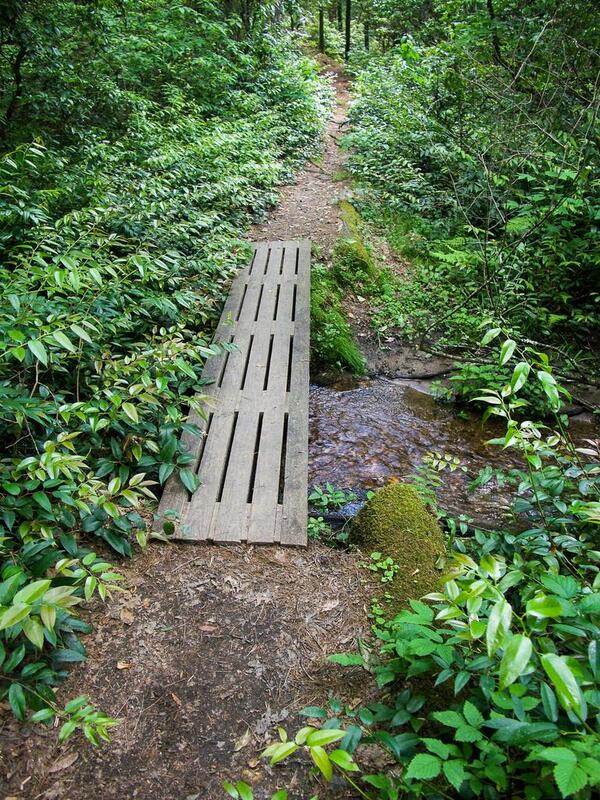 The Barnett Branch trail climbs gently across the edge of the valley through woods filled with mountain laurel, and crosses Yellow Gap Road (FS 1206). 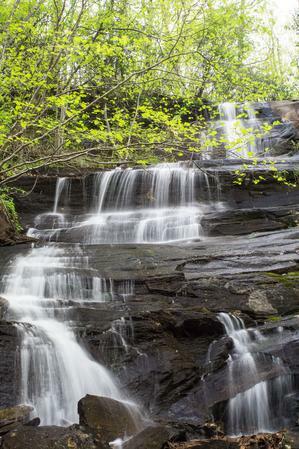 Past the road, it climbs a wee bit more, but reaches the base of a 25 or 30 foot waterfall in about 0.3mi. It's definitely worth visiting if there's not a drought, but may be just a trickle during dry periods. Return to the Pink Beds loop and turn right to continue the hike. 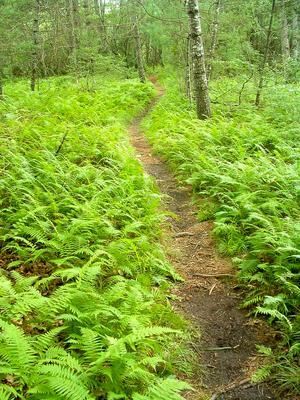 Toward the end, the trail will pass through several large clearings in the forest. These man-made meadows are called "wildlife openings" by the Forest Service, which it keeps mowed for the benefit of grazing animals and those which like to live on the fringe areas between woods and grass, such as deer and wild turkey. Hike this section at dawn or dusk and you're likely to see one of them here. Reaching the fields signals your approach toward the end of the loop. When you reach the fork, turn right, and climb the small hill back up to the parking area to finish the hike. Elizabeth Pajak said: A local suggested this trail to us, he said it was about 3 miles and fairly easy hike for kids. There was no mileage marked on the trail sign, so we ignorantly set off with a 3 and 5 year old at 4:00pm. Turns out it was an almost 6 mile hike! We were practically running the second half of the trail trying to make it back before dark (we didn’t). We had a backpack for our youngest to ride in, which is the only thing that saved us. We got to the parking lot right as darkeness had fully set in. We had to use flashlights on the trail for the last mile. The trail itself was beautiful. Even with the many mud patches. I loved the creek crossings, and the canopy trees over the trail were really pretty, even in winter. We would hike this again, but definitely earlier in the day. We didn’t get to enjoy the beauty of the last 3 miles lol. 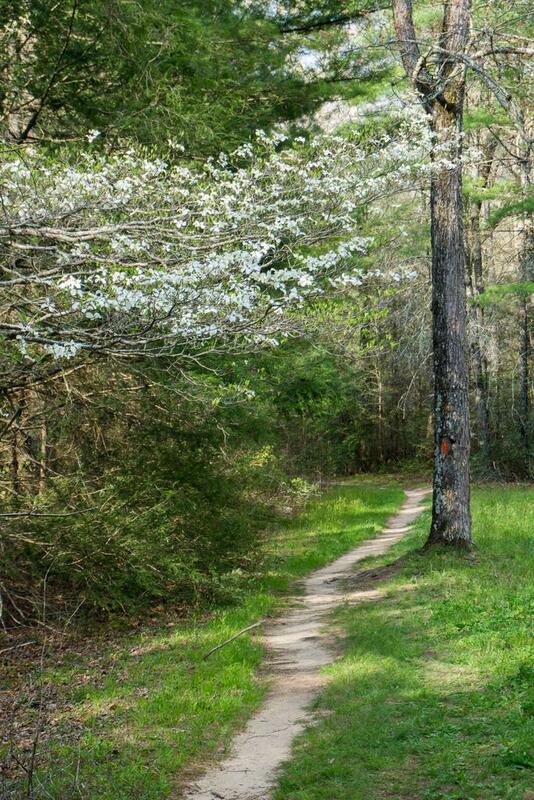 I’m sure during spring this trail is absolutely beautiful. I hope they mark the mileage for anyone else who decides to hike this in the future. Caroline Coleman said: My husband hiked Pink Beds Loop today and LOVED it! A very pleasant, but good cardio workout, with such beautiful scenery. There were a lot of roots to cross, which made it fun and difficult at times. The bridgeway at the end (or beginning depending on which way you go) is very nicely done and surely took a lot of time to complete. We will hike this trail again - next time starting on the right. I highly recommend it. My Garmin said it was a 5.2 mile loop from the parking lot. john brothers said: we hiked the trail yesterday after a picnic. we thought it might be a leisurely quarter mile stroll. Wrong!! It didn't say how long! We started around 2:30 and got back to car at 5:45! Had no clue it was over 5 miles long! Avoiding ice and rime was the toughest part. We took no water and weren't prepared for it.I got back as darkness fell. Could have been a disaster if it got dark and no water for so long. Mark the distance so people won't be fooled! 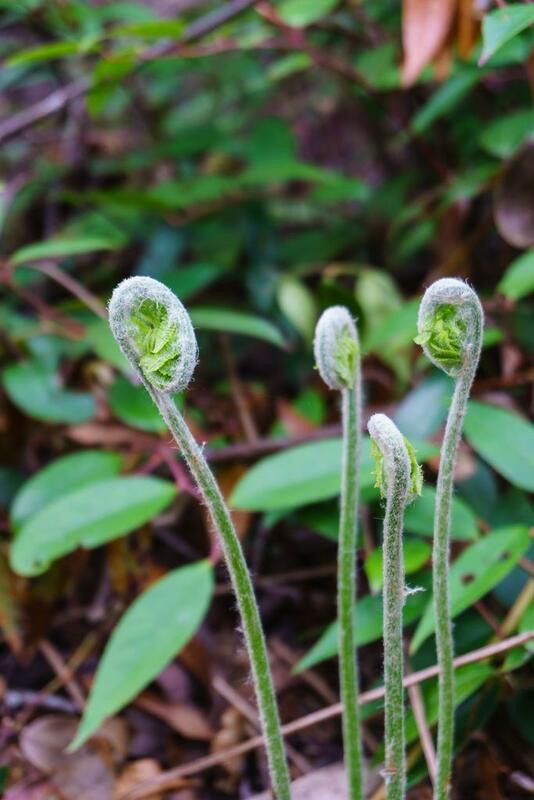 Adam Brice said: Wife and I hiked this trail at a fairly consistent pace and it took 2.5 hours. That did include a 15 min break. Trail is well marked and was fairly flat as stated and a bit muddy in places though we were able to step around mud without much difficulty. Most of the trail is in pretty dense tree cover. It rained while we were on the trail and we didn't really get wet at all. Nice hike through some interesting terrain but a bit longer than I expected. Matt Ryan said: Can I park overnight at the 276 parking lot? Taking a group of young boy scouts for their first backpacking trip. Jordan M. said: @Cynthia, the best contact would be the US Forest Service Pisgah Ranger District, (828) 877-3265, pisgahrd@fs.fed.us. Last time I was there in March, I noticed the sign was faded and kind of hard to read, too. As to the length - for many years, this was a 4.6 mile hike. I re-measured it after the re-route with GPS and GIS measurements at 5.1 miles. The Forest Service officially lists it as 5.0 miles. I'm not sure how accurate devices like a fitbit are, but I'm pretty sure it's less than 6 miles. Who's up for doing this hike with a measuring wheel! Jakndeb said: Couple sixty-somethings hiked the full loop today. Great weather and the trail was in nice condition. Unless you wanted to you didn't have to even step in mud, the boardwalks and bridges were that well done. The moderate 5 or 6 miles, whatever it is, was about all these active but nooby hikers wanted to enjoy. Wilma said: Hiked this trail today, beautiful weather, and the trail is in good shape. Measured it using my Fitbit and it is indeed 6 miles. We went counterclockwise and found that a large portion of the back half was uphill, not hard but wearing since it's heading toward home. Next time we will go clockwise. We only passed 2 small groups of folks so it was pretty nice. M sanders said: This trail is at least 6 miles. And it is not marked as to the distance. Be prepared. 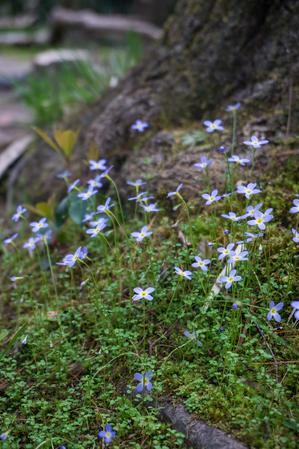 Mickey C said: Looking at the map above, what is the name of the blue spor trail that intersects with Pink Beds . Where does this trail go ? Phil Hawkins said: Nice hike; good for runners, too. The boardwalks were a massive undertaking. Suggest you give credit on this site to the folk who did the work. Jordan M. said: We finally made it back on June 16, 2013. 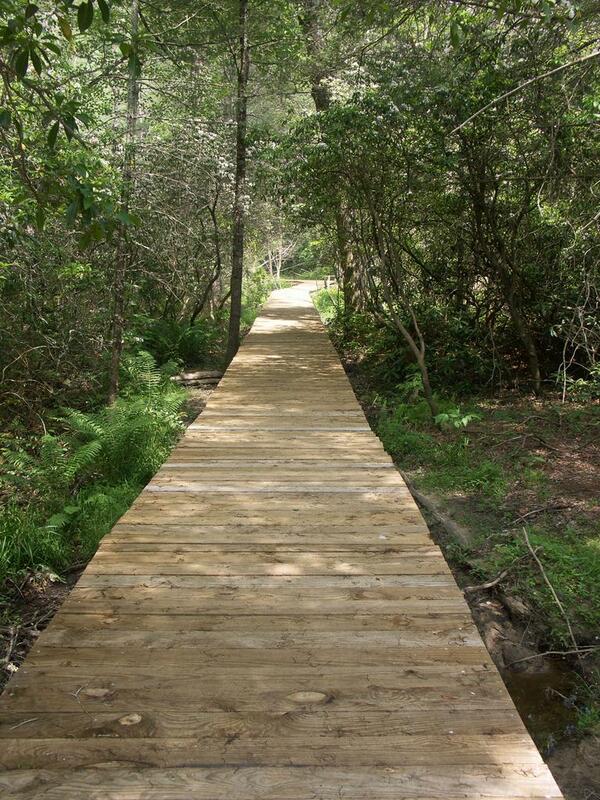 The boardwalks and bypasses are done, the loop is in great shape and we've updated the description and photos. Enjoy! Jake LaGory said: The loop is now open on both sides and passable without any difficulty crossing the wet sections. jake lagory said: As of March 9th 2012, the dammed portion of the trail is closed for construction. You can still hike the trail off to the left where the loop starts, but you'll have to double back to get back to the parking lot. 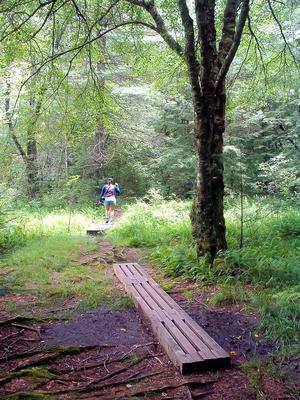 It's still a gorgeous hike, but it takes a while to get to the boggy portions described in this article. 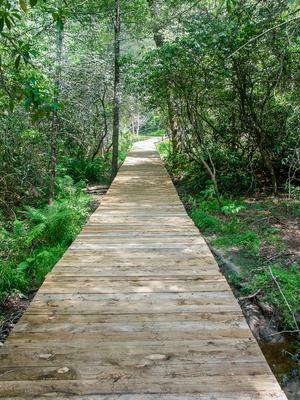 I hope they are building a boardwalk or bridge through the muddy parts,as it would make for a pretty unique hiking experience if all the beaverdams are left in place. Mark jones said: As of august 16, 2011 the beaver dam (which is really 3 dams in a row) has still not been bridged and over 100 yards of the trail has been flooded. There is a quite unstable connection of logs, bridges, and islands that might work to bypass it, or you can just get muddy as I did. It is only about 10 minutes from the parking lot if you turn right at the start of the loop. Keep in mind if you go left first that by the time you reach the dam (if you didnt take the mountains to sea trail shortcut) it is going to a be long 4.5 miles back the way you came. My advise is just come prepared for some mud if you want to hike this trail - which, by the way, is one of my favorites in the asheville area. Enjoy your hike!